Our powder room definitely needed to be painted a neutral color since we are planning to put our house on the market in a few months. It is a VERY small space and it was dark so it was very difficult to photograph before. It was definitely a bordello red, but it looked better in person than it does in these photos. It doesn't even look like the red on the wall goes with the red on the artwork, but it did. So, we picked a color from Lowe's, and of course, I didn't like it, so I mixed it with something I already had. I painted the mirror an old rubbed bronze because the gold mirror just didn't look right with the new color. I showed you how I did this in a previous post. Here the paint looks more of a yellow, but it isn't. I also painted the tin container on the left a more avocado green so that it would go with the urn on the wrought iron shelf. So we can check another item off of the house project list. This project was done in January, lest you think we didn't work on our "honey do" list this weekend. We checked several small things off of the list which definitely feels great! Next weekend we will be starting the tiling of the upstairs bathroom. We have 2 weekends scheduled for it. Hope you all had a great weekend. Please leave a comment and let me know what you did! Pam, I love the new color. I had to repaint mine last year, too. You should have no problem selling except for the economy. I should have you come and redo our powder room! Brava! Happy Mosaic Monday! Pretty redo. Like the new paint color. Both colors look good! but the beige is definitely more for the masses! Lucky finishing up the list and selling your house! terrific transformation. I like all the new colors you used. Nice! Love the new color! 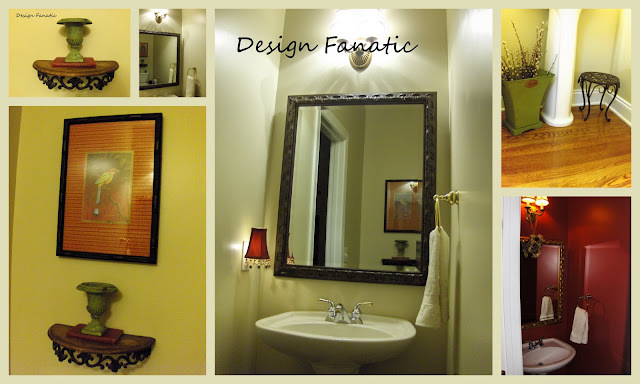 Definitely a great job and it looks like a darling powder room. The new color makes it look so much bigger! Good luck selling! You shouldn't have a problem with all the work you have done! The new color looks great! Good luck on your list. I hope you'll drop by AtticMag to see Jane's Met Monday post. What a beautiful job on this...it also made a great mosaic!!! Your powder room looks lovely. I like the color a lot. The tin container is amazing in that color too! Wow! What a lovely mosaic. I love what you did with your powder room but may I say that I loved the old colour. I understand that you want it light to make it bigger. Love the accent and the colors of painting. I like the color you mixed - sometimes green can become a neutral - it really works in that small area! Nice Job. I love the color change. Congrats! You're always so busy! Where does the energy come from? my powder room is as small as yours.. I've painted it several times.. the exact sink etc..and never thought of such a dark color.. hmmmm I really like yours! Love it! You did a beautiful job! Thank you for sharing in the DIY Project Parade!